Digital Media Bluetooth Audio Cable This interface cable will connect to CD-Changer Port of the back of your Original OEM Radio as a input source of Audio will then connect wirelessly via Bluetooth to your Phone allow playing music from your phone to car audio speaker system wireless via Bluetooth . Will retain all existing steering wheel control button like volume - / , This interface adaptor come with 1 x USB Port for easy charging 5V / 1A Standard port can be use with USB to Lighting Cable for iPhone or Mini USB Cable for Android Phone Charging ( Cable is not included ) AUX Input x 1 Port This part works in these Vehicles : Honda Accord 2003 - 2011 Honda Accord Euro 2004 - 2011 Honda Civic 2005 - 2011 Honda CR-V 2007 - 2012 Honda Jazz 2002 - 2012 Honda Ody. Digital Media Bluetooth Audio Cable This interface cable will connect to CD-Changer Port of the back of your Original OEM Radio as a input source of Audio will then connect wirelessly via Bluetooth to your Phone allow playing music from your phone to car audio speaker system wireless via Bluetooth . Will retain all existing steering wheel control button like volume - / , This interface adaptor come with 1 x USB Port for easy charging 5V / 1A Standard port can be use with USB to Lighting Cable for iPhone or Mini USB Cable for Android Phone Charging ( Cable is not included ) AUX Input x 1 Port This part works in these Vehicles : Mazda ( Without Navigation System ) 2 2003-2008 3 2004-2008 5 2006-2009 (without entertainment system) 6 2002-Oct.2003 6 2006-2008 (. Digital Media Bluetooth Audio Cable This interface cable will connect to CD-Changer Port of the back of your Original OEM Radio as a input source of Audio will then connect wirelessly via Bluetooth to your Phone allow playing music from your phone to car audio speaker system wireless via Bluetooth . Will retain all existing steering wheel control button like volume - / , This interface adaptor come with 1 x USB Port for easy charging 5V / 1A Standard port can be use with USB to Lighting Cable for iPhone or Mini USB Cable for Android Phone Charging ( Cable is not included ) AUX Input x 1 Port This part works in these Vehicles : TOYOTA 4 Runner 2003 - 2013 Avalon 05 - 13 Avensis 03 - 11 Auris 2007 Camry 05 - 13 Celica 03 - 05 Corolla 05 -13 FJ Cruiser. Will suit: All FG Falcon MKI Sedan / Ute (with an Ipod kit already fitted to the vehicle) from 2008-2011. Ford BA & BF Falcon / Territory Auxiliary adaptor lead. Works with all Ford BA's BF's and Territory's (Premium Colour Screen version and LCD Display). 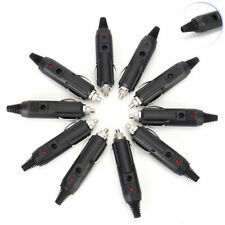 100% High quality Stereo Radio Aux Cable. 2pcs 380mm Coil Spring Compressor Clamp Heavy Duty Quality Car Truck Auto Tools. Aerpro FP958902. Subaru Impreza WRX Forrester Black Double Din Facia Kit Car Dash Stereo Radio FP958902. Product Code: FP958902. Facia to suit Subaru Impreza/ WRX / Forrester 2008-Up. All necessary brackets included. Ford BA & BF Falcon / TerritoryAuxiliary adaptor lead. Works with all Ford BA's BF's andTerritory's (Premium Colour Screen version and LCD Display). Ford Falcon (BF) 2005 to 2008. Ford Falcon (BA) 2002 to 2005. TOYOTA AUX/iPhone/iPod Interface Cable SKU : AUXIP5_TOY66 Use this Interface cable to add MP3 Music to your existing Original OEM Factory Radio via AUX Port without the need to upgrade to Aftermarket Stereo which involve buying expensive fascia kit . This interface let you play music via 3.5mm AUX Input . and Charge your iPhone / iPod via Lighting Cable . This part works in these Vehicles : TOYOTA 4 Runner 2003 - 2013 Avalon 05 - 13 Avensis 03 - 11 Auris 2007 Camry 05 - 13 Celica 03 - 05 Corolla 05 -13 FJ Cruiser 07 -13 Hiace 03 - 13 Highlander 04 - 13 Land cruiser 03 - 13 Matrix 05 - 13 Mark X 05 - 11 MR2 04 - 10 Prius 04 - 13 RAV4 03 - 13 Sequoia 05 - 13 Sienna/Previa 04 - 10 Solara 04 - 08 Tacoma 05 -13 Tundra 04 -13 Venza. Aerpro FP953000. - Product Code: FP953000. Facia trim plate. Mounting instructions. Double-DIN Mounting Cage. Side mounting brackets and screws. - This kit includes the following Product Info. Suits: Ford BA BF Falcon 2002 - 2008. Will also fit BA BF Fairmont although you will lose functionality of the bluetooth. Territory SX SY 2004 - 2011. Includes 3.5mm Stereo to 2 male RCA plug Lead. Aerpro FP9018. - For Commodore VT Series I, II & VX Series I, II & VU UTE. Most recent donors. OUR DONATIONS. SCHEDULE PICK UP. PICK UP AT DEER PARK (VIC). - Product Code: FP9018. 2 Pin SAE Bullet Type Plug & Socket Cable. Heavy duty plug and socket with bullet type connectors. Commonly used in automotive, motorcycle and solar applications. Direct Deposit (Australia only). Cable Length: 270mm. Car Stereo Radio Aux Auxiliary Adaptor bluetooth Cable For Ford Ba-Bf Falcon. For Ford Falcon (BF) 2005 to 2008. For Ford Falcon (BA) 2002 to 2005. 1x AUX Adaptor Harness. bluetooth version: bluetooth v4.0 with EDR is supported. Features: AUX Port, USB Port. • Ford Falcon. Male AUX cable length:123cm. -Perfect to replace worn out audio AUX cable. 1x AUX Adaptor Harness. • Ford Territory SX-SY (Ghia, Turbo, TS, TX etc). 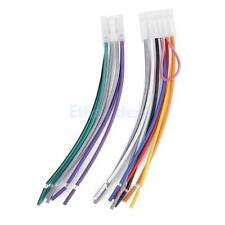 1x 3.5mm Male AUX cable. Toyota Antenna Adaptor Antenna adaptor to use install OEM Radio to eariler model car factory radio plug to aftermarket antenna socket This part works in these Vehicles : Subaru BRZ 2012- Toyota 86 2012- Toyota Corolla 2012- ZRE182R Hatch Toyota Corolla 2013- ZRE172R Sedan Toyota Hilux 2012 on Toyota Prado 150 2009-2013 Toyota Prado 150 2014-. Adaptor is a great addition to any camper, caravan or 4WD for running two accessories from. one Red Anderson Plug. Red Anderson Plugs are commonly used for solar panel connections. RED ANDERSON PLUG DOUBLE ADAPTOR. 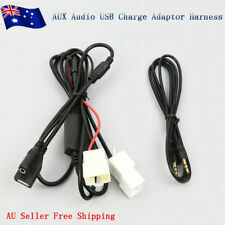 Car Stereo Radio Aux Adaptor Bluetooth Cable Harness For Ford Falcon Territory. Ford Falcon (BF) 2005 to 2008. Ford Falcon (BA) 2002 to 2005. 1x AUX Adaptor Harness. Bluetooth version: Bluetooth v4.0 with EDR is supported. Aerpro FP7310. Double DIN Facia Kit for Hyundai i30 2007-10. Black finish. Kit requires modification to factory facia panel. Hyundai i30 FD 2007-2011. Dash needs to be cut out. Black finish. Suitable for. HONDA Bluetooth Interface Cable SKU : YT-BTA_HON2 This interface cable will connect to CD-Changer Port of the back of your Original OEM Radio as a input source of Audio will then connect wirelessly via Bluetooth to your Phone allow you to answer and talk on the phone via your car audio speaker together with play music from your phone to car audio speaker system wireless A2DP . Will retain all existing steering wheel control button like volume - / , Support Bluetooth AVRCP Control : Control Prev/Next , Pause/Play .....from your radio and or SWC This interface adaptor come with 1 x USB Port for easy charging 5V / 1A Standard port can be use with USB to Lighting Cable for iPhone or Mini USB Cable for Android Phone Charging ( Cable is not included ) AUX Input x 1 Port This part w.
Aerpro FP997505. Single DIN Facia Kit with Storage Pocket for Mazda 626, 323, Protege, Tribute, MX5 and Ford Escape. Mazda Protege 2001-2004. Mazda Tribute 2001-2005. Mazda 323 (Familia) 2001-2004 BJ II. Features:The design of bluetooth adapter, with unlimited bluetooth technology as the foundation.The line of USB interface can be inserted U disk play music.Made of advanced oxygen free copper wire and original AMI head.Supports all Bluetooth enabled devices.Support play music, transmits audio from mobile phones, tablets.Description:Directly and easily into the car interface to play music, while supporting U disc playing music.Suppot for downward compatibilityOne for two to two bluetooth devices can be connected at the same time.For VW AUDI MODEL (Suitable for 2010-2017 VW Audi MDI AMI MMI interface models. )For Audi A1 A3 A4L A5 A6L A8 Q3 Q5 Q7 TT (2010-2017 with AMI MMI interface)For Audi A3, A4/S4, A5/S5, A6/S6 (2010 onward)For Audi A8/S8 and A8-L (2010 onw. Fits Models: BMW E39 E53 X5 E60 E61. Pair your phone with our bluetooth module,and choose Aux from your radio. 1 x Bluetooth Audio Adapter. No functional limitations of the car radio. It is possible from your smartphone to your car stereo to stream. For VW AUDI MODEL (Suitable for 2010-2017 VW Audi MDI AMI MMI interface models.). For Audi A1 A3 A4L A5 A6L A8 Q3 Q5 Q7 TT (2010-2017 with AMI MMI interface). Bluetooth Vision: Bluetooth V4.0 (support downward compatibility). Whatever components your car comes with, there are plenty of innovative adapter solutions available that will ensure you can make the most of your vehicle. 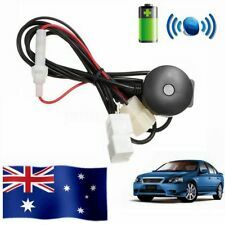 Whether you need a cigarette lighter adapter, a steering wheel adapter, a way to plug in your electronic device, or a connection to your speakers that is compatible with your phone, you'll be able to find the perfect car electronics accessories designed for use in vehicles in Australia right here. It should be possible to better control the entertainment in your car without making any compromise when it comes to the safety of you and your passengers. There are plenty of remote control adapters, for example steering wheel adapters or those adapters which create improved connectivity between your phone and speaker system, that will allow for a safer driving experience with more control for the driver. Mobile phones and smart devices are incredibly useful, so you hit a bump in the road when you've run out of battery on a long journey and have no way of charging it. Electronic adapters in your car solve this problem, by converting your cigarette lighter into a USB charging port that can charge a wide range of different devices. Compact enough to be stored in the glovebox, a suitably adapted car component will ensure you'll find yourself back on full charge in no time at all. Electronic car adapters aren't just used for increasing the charge on your phone or computer, they've got plenty of other uses too. Whether you need to be able to control your music remotely, adapt your CD changer, charge using a USB-C cable, adapt your antenna or line output, or even charge different devices simultaneously using a cigarette lighter splitter, you'll find the products you're looking for here.